The technical definition of balance is the uniform distribution of mass about an axis of rotation, where the center of gravity is in the same location as the center of rotation. A balanced tire is one where the mass of the tire —when mounted on its wheel and the car's axle— is uniformly distributed around the axle (its center of rotation). 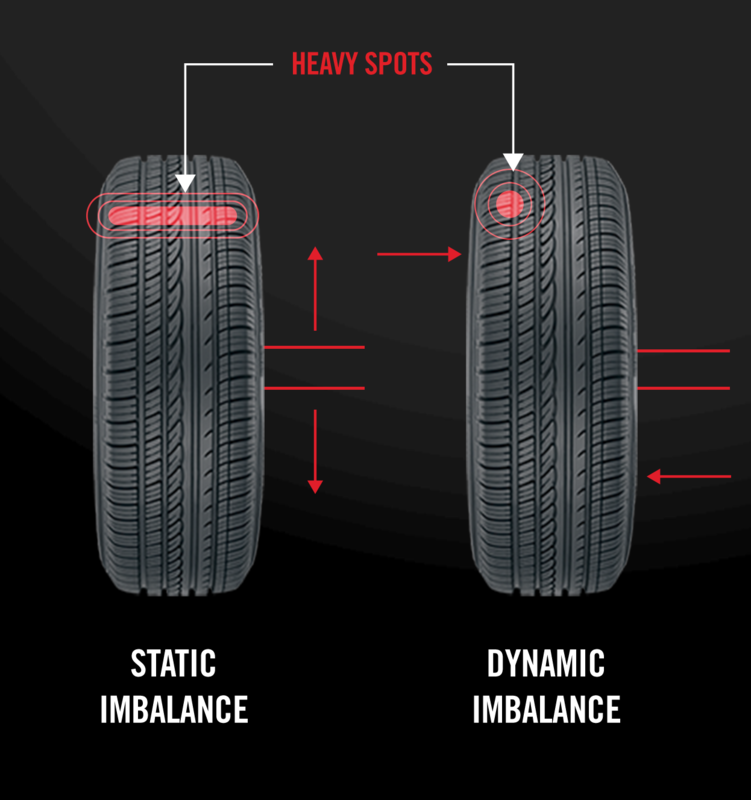 Balanced tires can spell the difference between a positive and negative driving experience. Drivers of high-performance vehicles will be more sensitive to imbalance problems, but no driver is happy with an annoying vibration. The most noticeable effect of Imbalance is vibration, often starting at speeds between 40 and 45 MPH. Shortens the life of tires, bearings, shock absorbers, and other suspension components. Vibration is the most noticeable effect of imbalance. It often first becomes apparent between 64 and 72kmh and increases in magnitude with greater speeds. Occurs when there is a heavy or light spot in the tire so that the tire won't roll evenly and the tire/wheel assembly undergoes an up-and-down movement. Occurs when there is unequal weight on both sides of the tire/wheel assembly centerline. The tire/wheel assembly has a side-to-side movement. Run-out is often caused by improper bead seating on the rim or irregular placement of tire components during the manufacturing process. Bad bead seating is usually the result of bad improper mounting or the use of improperly made wheels. A small degree of this imbalance is acceptable, but too great a run-out causes vibration and excessive tire wear. An "out-of-round" situation where vibrations are produced as the wheel spindle moves up and down. A side-to-side or wobbling movement of the tire and wheel. It is less common than radial run-out. Sensitivity of a vehicle to vibration from radial run-out is four to eight times that of wobble from lateral run-out. Heavy or light spot balancing is corrected either statically or dynamically, depending on the type of imbalance. Achieved with a static "bubble" balancer but does not correct for dynamic imbalance. Achieved with a dynamic "spin" balancer where the tire/wheel assembly is balanced both statically and dynamically. Achieved by rotating the wheel and tire assembly two stud positions on the hub, or by rotating the tire 180 degrees on the wheel. If run out is still over specification, check wheel run out and mark the low point. Rotate to match the high point of the assembly run out with the wheel low point. If the assembly run out is still too high and the wheel is within specification, replace the tire. Achieved by using a run-out gauge to check both the tire and wheel. Chalk-mark the highest point of run-out on both the wheel and tire. Replace whichever (wheel, tire, or both) is out of specification.